While staying at home to wait out the typhoon currently hitting Taiwan, I surfed the iPhone application page. I found these 3 applications that are pretty interesting. These applications, available free from Apple shows the time (among other functions). The applications are from Bell & Ross, Glycine and Victorinox. Whilst the Bell & Ross and the Glycine applications only tells the time, the Victorinox applications offers additional functionality. The Bell & Ross application offers a choice of 3 watches to choose from, BR01-92, BR01-97 and BR03 Type Aviation. 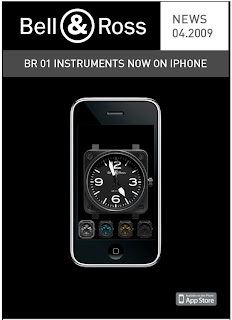 The BR03 Type Aviation offers additional functionality of stopwatch, alarm and timer. You can also find a Bell & Ross retailer near you via the application. The Glycine Airman Watch application is a basic application to tell time. It does however offers the time of a second time zone and the a view of the movement of the watch via the display case back. 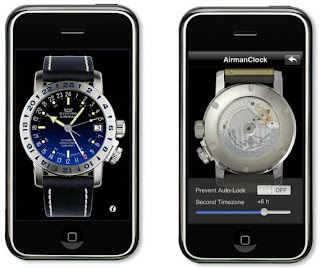 The Victorinox Swiss Army iPhone application is the most complex of the 3 application. 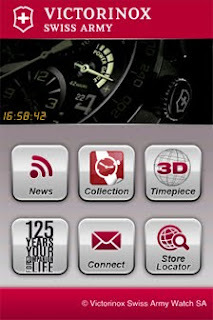 It offers The Victorinox Story - 125 years collection, a 3D view of their timepieces, a simulation of a Victorinox watch with time telling, alarm, stopwatch and timer capability, store locator and latest news on Victorinox Timepieces. These are indeed cool application to have on your iPhone.